Breaks the Fourth Wall: The game does not break the wall in the purest sense, though it does seem to know that it is a game. There are also references / allusions to real world events. Genre Deconstruction: The game serves as a deconstruction of RPGs such as Skyrim, wherein the player can buy items from numerous shops. It also deconstructs management sims where you can set prices and build up a business. 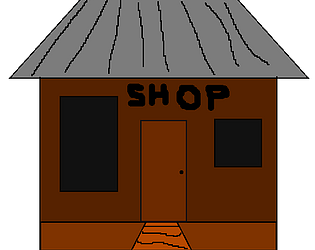 Game Mechanic Deconstruction: It deconstructs the mechanics of buying and selling from RPG shops, as well as the role of the shopkeeper in such games. I used the VT323 font from Google Fonts. The controls are all mouse-driven, except for when button prompts are listed. You can close the game at any time using Esc. This is my first attempt at entering a game jam such as this. I created the game by myself, working for about a day spread across two weeks. I wrote it in C++ using the SFML library, which I have some experience with but am still learning. On the off chance the game does not run correctly, try making sure that Visual C++ is installed (though I tried to make sure it works). The opening aesthetics were nice. I think there needs to be more feedback as to how much you're progressing and how the prices are affecting demand - because of this I gave up but started playing again after seeing the comments below saying that there was more to the game. Once the game actually progressed, it got a bit more interesting with some nice humour too. Would be worth having more feedback after making the choices and making the start more engaging. Nice work. Graphics/sound could be improved (even paint has a straight line tool, come on), but otherwise short and fun. Haha you got me about the graphics, that's some rough programmer art right there. Thanks for the feedback! Hmm, care to elaborate? It gets fairly meta as you continue playing. That's fair, it definitely is slow to get going and could use more feedback. Thanks for playing! That escalated quickly... a nice clicker with some meta references. I love the rapid pace the game scales up at and the choices are some solid humour. I would have preferred a bit more nuance in the pricing and even item choices and there wasn't much feedback to let me know how I was going. Definitely got a few good laughs out of me. Glad you enjoyed it! I agree about the choices / feedback; given some more time I would like to improve how that is communicated to the player and add more HUD in general. Hey, the game worked this time. I really liked the overall feel of it. I think it could use a bit more feedback, since it was hard to tell what profit you'd actually get after a while. I made a mistake and let the rich people control profits and it just killed it =( terrible decision! Unfortunately, I cannot get the game to open. I tried to get it working, I promise and rechecked that I had Visual C++ installed. Nada... I get an error like "The procedure entry point alcCaptureSamples could not be located in the dynamic link library ...... sfml-audio-2.dll" I'm not sure if you have any tips to fix this issue! Hmmmm you may need the OpenAL32 DLL. I will reupload with that included! Try re-downloading, the new version includes the OpenAL DLL. Let me know if that works!